Pioneers in the industry, we offer barrel heater from India. Php’s barrel heaters are designed and manufactured with more than 40 years of practical experience for superior performance and life expectancy. 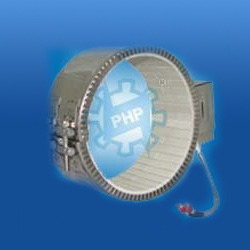 As a manufacturer specialized in industrial electric heating elements & the desire to provide quality products and services to our customers both OEM’s & end users, PHP specializes in designing energy saving ceramic band heaters, mica band heaters, nozzle heaters & strip heaters to your exact specifications. Available in Mild steel / Chrome Nickel Steel sheathing with Power Saving Options. Looking for Barrel Heater ?